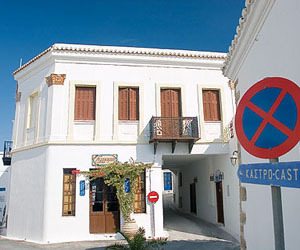 Writing books about small hotels in Greece? I have to admit that the idea did not come to me from the start. It was after spending many weekends in great and not so great small hotels that it slowly dawned on me that my experiences could actually be the basis for a book that could eventually even be helpful to people. It was a long and arduous process, not least of which was finding a publisher who actually thought that this was a worthwhile project. I eventually did, however, and my first book (Great Small Hotels in Greece) was published in December 2002 and proceeded to sell nearly 20.000 copies, proving that the market was definitely there and there were many people looking for exactly the same places as I was. Later on I decided to team up with a great photographer, fellow Dutch André Bakker, to produce a second book (Around Greece in 80 Stays) in March 2006. While the first book put its emphasis on discovery, the second focussed more on bringing out the beauty of the selected places and the stories of the people behind them. Then, there was this website, which kept me busy for a few years, but eventually, after receiving lots of emails with questions about ‘the new book’, I decided to go for it again. Another year with lots of travelling, fantastic discoveries, and so much choice! 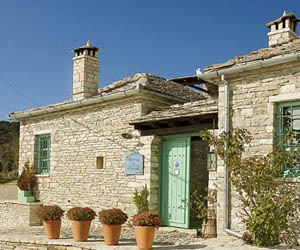 Published in June 2013, “Jacoline’s Small Hotels in Greece” features 222 wonderful little places to stay. Greek photographer Julia Klimi was crazy enough to say ‘yes’ to this project and take care of most of the photography. 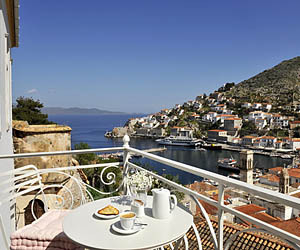 To order your copy of “Jacoline’s Small Hotels in Greece”, click here. To order your copy of “Μοναδικά Μικρά Ξενοδοχεία στην Ελλάδα”, click here. Photography: © Julia Klimi, Michèle Witteveen et al. 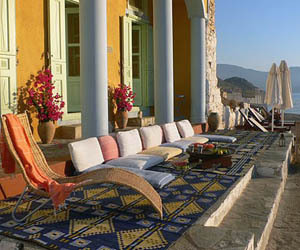 Maps: © TERRAIN Editions S.A.
One of the most beautiful hotels in Greece. 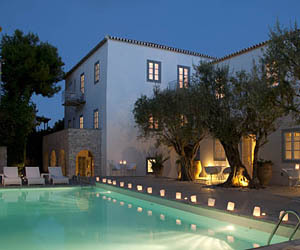 A 13th century manor house in the hills near Monemvasia turned into a luxurious spa hotel with a great swimming pool and a restaurant serving refined Greek cuisine. 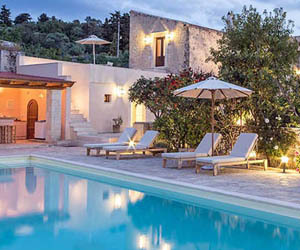 A 19th century village house in the historical Chora of Kythira Island converted into a bed and breakfast with six immaculate bedrooms, a cute little café and heaps of charm. 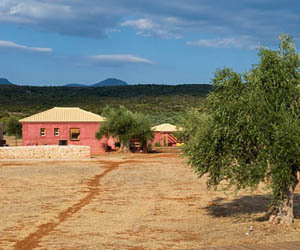 A stylish, superbly comfortable eco/agro retreat in the midst of olive groves, where you can simply relax and unwind, or sign up for yoga, meditation, tai chi, photography, wine making or cooking workshops. Two small and adorable self-catering houses in medieval little “castle” town of Monemvasia, one of Greece’s most magical historical sites. A great place to stay if you want a unique holiday experience. An old farm turned into a fun (and affordable!) little hotel on the outskirts Parikia on Paros, with charming self-catering studios and apartments, a small pool, and lots of artistic flair. The ultimate Greek island dream. 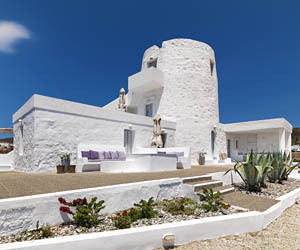 An old Cycladic windmill on Kimolos converted into a boutique hotel with five beautiful bedrooms, great views and a pleasantly laid-back atmosphere. A stylish and relaxed family-friendly beach hotel in Chania, Crete. 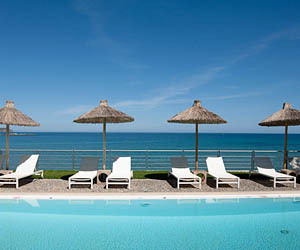 Very comfortable accommodation, friendly staff, a beautiful swimming pool and an excellent restaurant. Great for holidays with children. 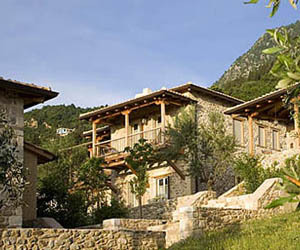 A fantastic family-run hotel on the slopes of Mount Olympos, offering delicious home-cooked meals, charming, comfortable accommodation and warm hospitality. Great for lovers of the outdoors! 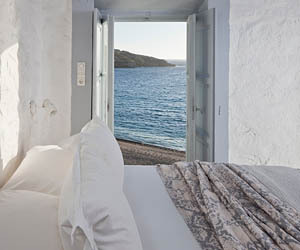 Charming late 19th century miners’ houses turned into a relaxed trendy hotel on one of the most beautiful beaches on the island of Serifos. Perfect for truly laid-back and worry-free beach holidays. A comfortable and friendly hotel, overlooking one of the best beaches of Samos Island. 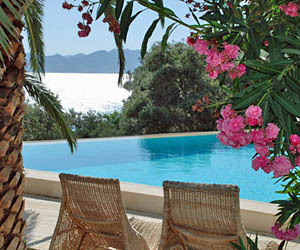 The perfect setting for relaxed summer holidays and family vacations in Greece. A stylish little boutique hotel in southern Mani with beautiful rooms, wonderful terraces, caring owners, fantastic food and a touch of discreet luxury. 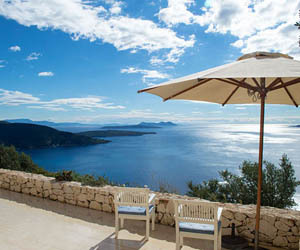 A great place for off-the-beaten-track holidays. 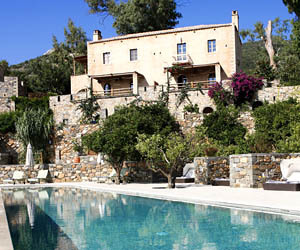 An inviting family-friendly boutique hotel in the mountains of the northern Peloponnese. Country-style decoration and a warm and easy-going atmosphere. One of the first hotels in Greece I fell in love with. A 600-year-old mansion converted into a stylish, family-run boutique hotel with luxury suites and a gorgeous courtyard garden. 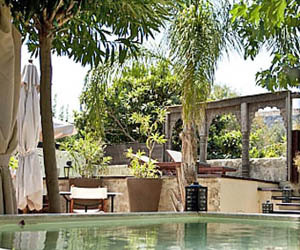 A slice of paradise in one of the quietest spots of the historical city of Rhodes. 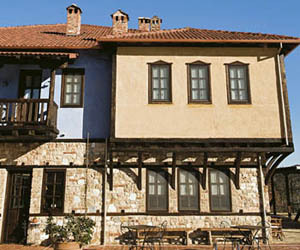 Gorgeous country-style accommodation at walking distance from Mystras. 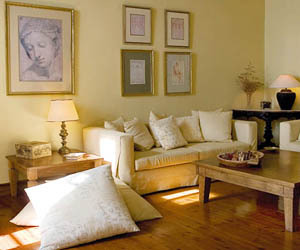 Fantastic rooms and suites offering a tasteful blend of tradition, aesthetics and comfort. Great breakfast, nice pool, beautiful views. 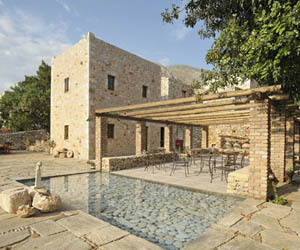 The pièce de resistance of the Cretan countryside: a beautifully restored historical hamlet with an olive press, transformed into a luxurious, stylish and peaceful country retreat hotel and museum. A Cycladic-style family-run hotel with some great extras: a sleek swimming pool, tasteful decoration, antique furniture, good food and a super friendly atmosphere. Paros island at its very best! A quirky little hotel in Tsangarada in Pelion where you will enjoy comfortable rooms, eclectic decoration, great breakfasts, elegant Greek/Mediterranean dinners and a friendly atmosphere. An adorable bed and breakfast in a village in Pelion, with simple but charming bedrooms, a peaceful garden and views of the sea. British hostess Jill delights her guests with an excellent breakfast. Adorable whitewashed cave dwellings and little houses in a quiet village where time seems to have come to a standstill. 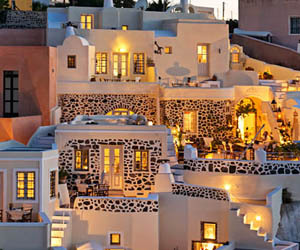 Affordable charm with an artistic touch on the island of Santorini. 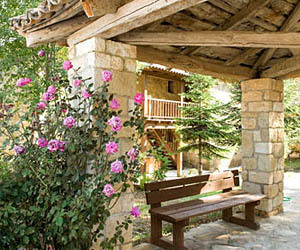 Relaxed and eco-friendly holidays in the Cretan hills. The ease of self-catering accommodation, with home-cooked meals on request. A welcoming atmosphere - a great place for family and/or walking holidays. 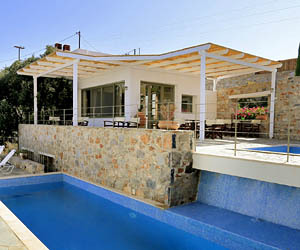 A small hotel on Crete with super friendly owners, an adorable little café, a sparkling swimming pool and spacious suites. In a quiet setting but lots of entertainment and beaches nearby. The cutest bed and breakfast possible. 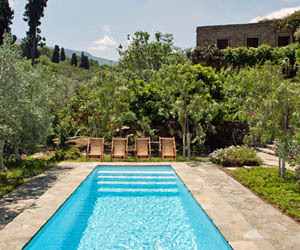 An old restored farmhouse with olive and fruit trees, cypresses, vegetable gardens and a small swimming pool. 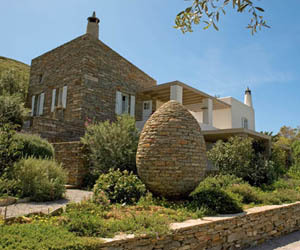 A hidden gem on the island of Andros. 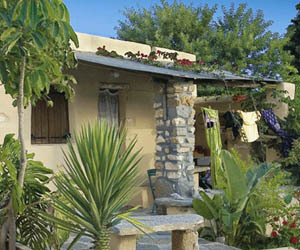 Charming, historical stone cottages set in nature, only one km from the sandy beaches of Makrigialos in southern Crete. Very quiet, absolutely affordable and totally eco-friendly. A historical waterfront house on the island of Kastelorizo, converted into a sweet little hotel with charming rooms, a magnificent suite, arty touches and a slightly oriental flavour. 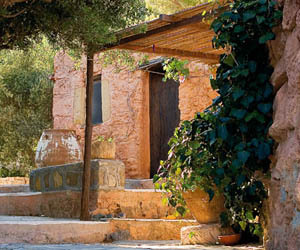 An old farm with vineyards and olive groves in the hilly landscape close to the beach and the port of the island of Kea. 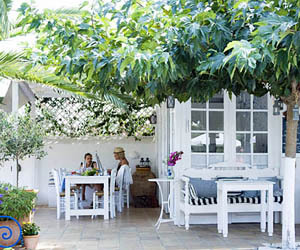 Beautiful self-catering cottages, a quiet atmosphere and eco-friendliness. 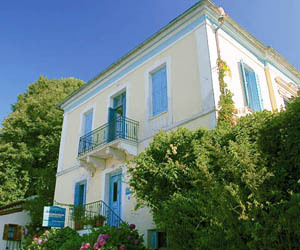 A wonderfully friendly and quiet agro-touristic retreat hotel close to the beach of Rovies in Evia. 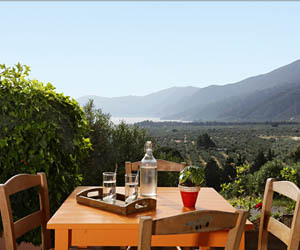 Comfortable accommodation, exhilarating views, delicious organic home-cooked food. 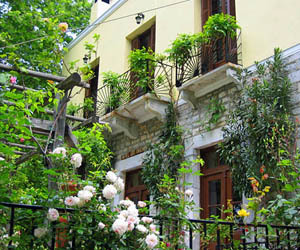 A 19th century property in Ano Pedina in the Zagorohoria converted into a charming little hotel with romantic rooms and cottages, homemade food and a hot tub with mountain views.